Talking Head offers a look inside an ambitious, in-progress printmaking project: a variable edition of printed assemblage sculptures by artist Peter Kelly. Combining lithography, screenprinting, and vacuum forming, this assemblage project explores the intersection of printmaking and sculpture. 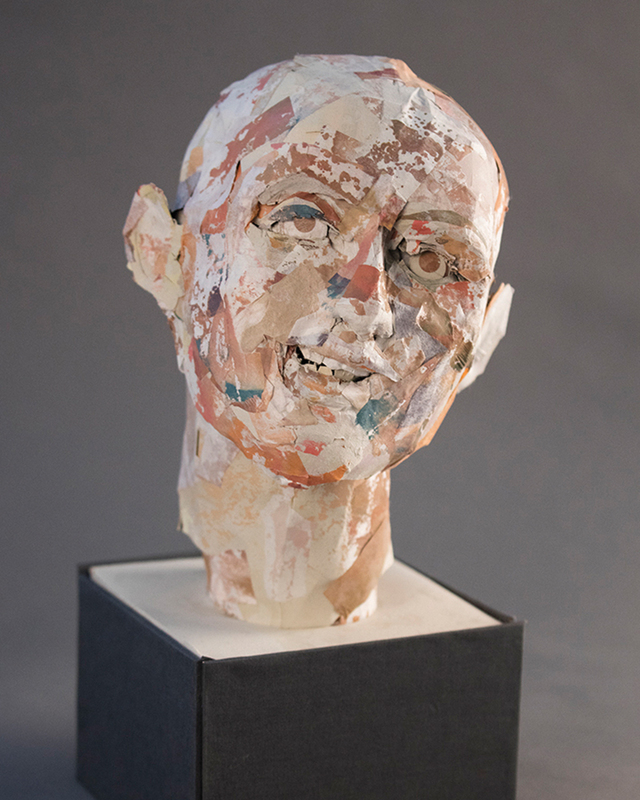 The exhibition highlights the subjective assembly process and offers a new prototype for understanding the human head—a layered form, a coming apart and piecing together of printed matter. Community artist and school art teacher MeLissa Kossick, who guides youth classes at the Museum on art, gardens, and pollinators, has created an enchanting mosaic design in the Creativity Pathway in the Serkland Gallery called Bee in Flight. An Emergent Belonging was created by Concordia College students Ashley Raduns, Katelyn Mitchell, Helena Langr, Elizabeth Vought, Ruth Peterson, and Chelsea Steffes. The work inspired by the form and function of a bird’s nest, was created under the leadership of professor Dwight Mickelson. Drawing on his childhood memories of the Great Plains, he created a work that speaks to the wide open spaces, huge vistas, and ocean-like skies of the region. While the Tallgrass Prairie is a community made up of a great diversity of species, Fragile Preservation represents a selection of them.